All school supplies will be available for students at the Adults in Motion School. Students will not be reimbursed for supplies. Students have access to the Garden River First Nation Resource Centre/Computer Lab. The Resource Centre/Computer Lab offers library and computer services that include book and video loan, historical archives, tutoring, video camera rental, computer training, internet use, scanning, website design, word processing, binding, printing and copying. Students will not receive a Commuters Allowance. The students will receive a Student Incentive for each course completed. For students completing a grade 9 or 10 course, an incentive of $100.00 per completed credit and $50.00 per completed half credit will be issued. For students completing a grade 11 or 12 course, an incentive of $100.00 along with a 3-month gym membership from the Garden River Fitness Centre per credit will be issued. For courses offered on-site, such as co-op, at least 90% of classes must be attended in order to receive the incentive. Please Note: When textbooks are on loan to the student(s) by the Adults In Motion or Independent Learning Centre, students must take good care of the books and return them before or at the final exam. AIM/ILC will not process any student work or issue credits if textbooks are outstanding. Students owe AIM/ILC the amount for any lost or damaged books. Insurance fees for all students on the nominal roll will be the responsibility of the First Nation. Students can purchase additional insurance if desired. Student receives student handbook and supplies are issued. Interviews are also available at any time with the teacher(s), however, please try to give advance notice. The teacher(s) will be responsible for academic counselling for students enrolled at the Adults in Motion School. Each student will have an individual interview at the beginning of the school year and students can then request appointments for counselling at any time throughout the school year. Referrals will be made to appropriate agencies for students as needed. There are two teachers available to assist the student should they need extra support or encouragement. The teachers will schedule time to see specific students, however students are encouraged to initiate meetings with the teacher(s). 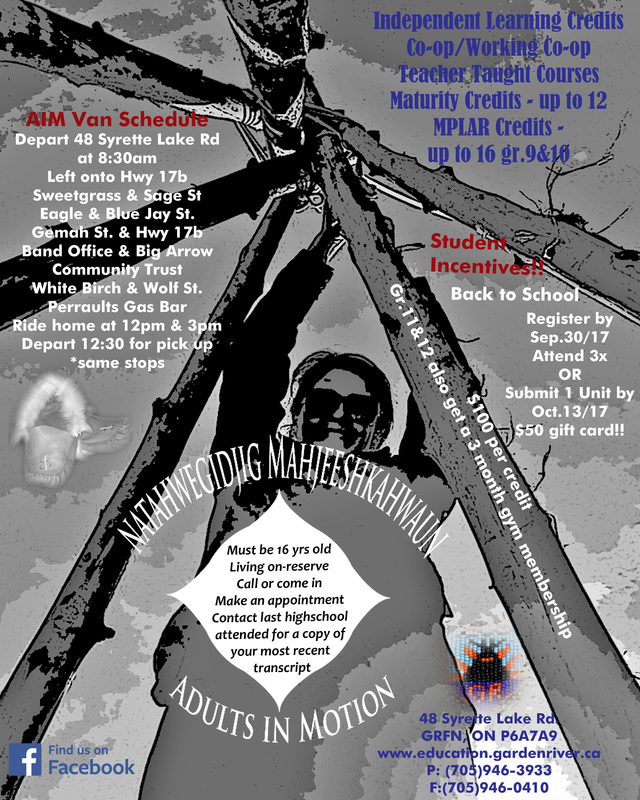 The Garden River First Nation Education Unit employs counsellors available for elementary, high school and post-secondary students. They provide liaison with students, teachers and parents. The post-secondary counsellor can provide the most recent information available on colleges and universities along with providing counselling on choosing the right school for you. Students have access to health services at the Garden River First Nation Health Centre. The Community Health Nurse is available Monday-Friday. The Nurse Practitioner is available three times per week. The Dietician, Doctor, Chiropractor and Occupational and Physical Therapist are available once per week on various days. Any student requiring medical attention will be referred to the Health Centre by the teacher(s). The Health Centre also provides various workshops throughout the school year. Tutoring Services may be available. Please contact the teacher(s) for more information.